We've all been there, driving on a busy road and faced with a slower moving lorry or large goods vehicle up ahead. We want to overtake it, but worry about doing so safely. Well, the Institute of Advanced Motorists (IAM) has offered some helpful advice to ensure drivers can do just this in the future; secure in the knowledge they are doing all they can to protect themselves, their passengers and other road users when faced with this sometimes daunting task. Firstly, drivers need to let go of any frustration that can come with following a slower vehicle – they need to remember that all EU heavy goods vehicles are limited to a top speed of 56 mph and therefore, even if the driver of the vehicle up ahead wanted to go faster, they couldn't. As a result, the speed of larger vehicles is generally very predictable and this can help to make the whole process of overtaking easier. Motorists are advised to leave an extra lane when overtaking on motorways and to be aware that many vehicles from the continent will be left-hand drive. 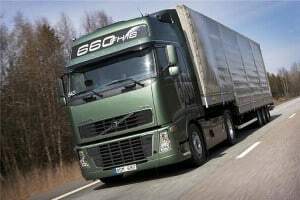 Therefore, their major blind spots will be down the right-hand side of the vehicle – meaning individuals need to be more aware of what is going on around them, as the lorry may not be able to see their vehicle clearly. Finally, avoid making last minute manoeuvres when overtaking and remember to leave more space – trucks are not as nimble when it comes to handling as their smaller counterparts. IAM head of driving standards Peter Rodger commented: "There is no reason why dealing with lorries should be a cause for worry. "What would make matters a lot easier for everyone is allowing space and time for the truck driver to react and do their thing. They will appreciate it if you show them this courtesy, and make your motorway journey a far sweeter experience."